Former president Maumoon Abdul Gayoom’s eldest son, Farish Maumoon, is seeking the ruling party’s ticket for the upcoming by-election for the vacant Dhiggaru constituency parliament seat. The by-election, scheduled for June 6, was triggered by the conviction of former Progressive Party of Maldives (PPM) MP Ahmed Nazim on corruption charges. The Supreme Court sentenced Nazim to 25 years in prison on April 6 for defrauding the state of MVR1.4 million (US$91,400). Ahead of a 4:00pm deadline today, four others have submitted applications to contest the primary, including Meemu atoll councillor Moosa Naseer, Imran Ismail, Moosa Naseer Ahmed, and deputy environment minister Mohamed Hanim. The candidates are to be first vetted on their loyalty to the party, role in campaigning for the party’s candidate in the 2013 presidential election, and the duration of membership in the party. A primary will only take place if more than one candidate receives over 75 percent or higher. The opposition coalition, made up of the main opposition Maldivian Democratic Party, religious conservative Adhaalath Party, and leaders of the Jumhooree Party, are meanwhile holding discussions on fielding a single candidate. Adhaalath spokesperson Ali Zahir told the press today that he will contest the by-election. The opposition coalition is holding talks to field a single candidate for a vacant parliament seat after the incumbent MP was sentenced to life in jail on corruption charges. The Elections Commission has scheduled the by-election for the Dhiggaru constituency for June 13. The call for applications will be open from April 15 – 25. Though the “Maldivians Against Brutality” coalition is made up of parties with vastly different ideologies, they are confident of fielding a single candidate against the ruling Progressive Party of the Maldives (PPM). Former PPM partners, the Adhaalath Party and the Jumhooree Party, allied with the main opposition Maldivian Democratic Party following what they called a government crackdown on opposition politicians including former President Mohamed Nasheed and former defence minister Mohamed Nazim. The two were sentenced last month to 13 years and 11 years in jail for terrorism and weapons smuggling, respectively. Meanwhile, JP leader Gasim Ibrahim is facing a US$100million fine that may bankrupt his Villa Group. Adhaalath spokesperson Ali Zahir and a PPM councilor for of Meemu atoll council Moosa Naseer have expressed interest in standing for the vacant seat. The former Dhiggaru MP Ahmed Nazim lost his seat on Monday after the Supreme Court convicted him of defrauding the former atolls ministry. Ex-MP Nazim, a former deputy speaker of the Peoples Majlis was convicted of defrauding the state of MVR 1.4 million (US $91,400) by submitting bids on behalf of non-existent companies to supply 15,000 national flags to the now-defunct atolls ministry. Would-be candidates are already setting out their stalls for the parliamentary by-election in Meemu atoll Dhiggaru after the seat’s previous incumbent was jailed for 25 years yesterday. Ruling party MP Ahmed Nazim, a former deputy speaker of parliament, was found guilty on Monday of defrauding the state of MVR 1.4 million (US $91,400) and sentenced to 25 years. 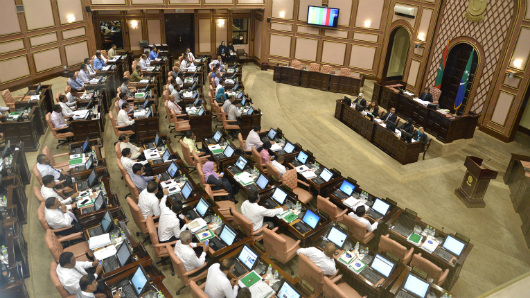 Members of both the ruling Progressive Party of the Maldives (PPM) and the opposition have expressed an interest in replacing him in the Majlis (parliament). Among these are Maldivian Democratic Party (MDP) member and Meemu atoll Muli island councillor Ibrahim Zaki, ruling party member and Meemu atoll councilor Moosa Naseer, and Adhaalath Party spokesperson Ali Zahir. “I have decided to run for Dhihgaru constituency and I will apply as soon as the elections commission gives notice,” said Ali Zahir. Elections must be held to fill parliamentary vacancies within 60 days under the constitution. Meanwhile, the MDP has condemned Nazim’s conviction, saying several aspects of the process violated his rights. “The lower court and the High Court threw out the case. So the state had appealed to the Supreme Court to overturn the ruling. But instead the Supreme Court ruled on the case,” said MDP MP and spokesperson Imthiyaz Fahmy. “So literally Nazim did not have a chance to defend himself,” Imthiyaz added. He noted that former defence minister Mohamed Nazim, accused of plotting to assassinate President Abdulla Yameen, and ex-president Mohamed Nasheed, accused of terrorism over the arrest of a judge, received shorter sentences than Ahmed Nazim. “[They] were charged with more serious crimes. So I don’t see the fairness in this conviction,” he said. “It seems that the courts had all ruled in favor of Nazim when he was in favor with the government. But after his spat with [Tourism Minister Ahmed] Adeeb, the courts had turned against him,” Imthiyaz said. Nazim, an ex-deputy speaker of parliament, was found guilty of defrauding the state by submitting bids on behalf of non-existent companies to supply 15,000 national flags to the now-defunct atolls ministry. He faces three more outstanding corruption charges. The Supreme Court today sentenced ruling party MP Ahmed Nazim, a former close associate of the president, to 25 years in jail on corruption charges, stripping him of his parliamentary seat. Nazim, an ex-deputy speaker of parliament, was found guilty of defrauding the state of MVR 1.4 million (US $91,400) by submitting bids on behalf of non-existent companies to supply 15,000 national flags to the now-defunct atolls ministry. The conviction completes Nazim’s fall from grace at a time when the opposition has accused the government of targeting political rivals. Nazim, who helped President Abdulla Yameen found a party in 2008, appears to have fallen out of favour with the government. The High Court in February 2013 acquitted Nazim on the basis that the witnesses, who had been his employees, were not credible, based on a Supreme Court precedent that testimony by accomplices to a crime is inadmissible . However, the Supreme Court today unanimously ruled the employees were simply following Nazim’s orders in the scam, which took place in 2004. Nazim’s downfall will trigger a parliamentary by-election in Meemu atoll Dhiggaru. There are three more outstanding corruption charges against Nazim, which also involve the use of “paper companies” to win bids for the procurement of 220 harbor lights, sound systems for mosques and an additional 15,000 flags. The police have previously said Nazim gained US$400,000 in total from the scams. Police in October withheld the MP’s passport on unrelated charges of blackmail. Tourism Minister Ahmed Adeeb at that time blamed Nazim for a damning report implicating him in a separate US$6million corruption scandal, and also accused Nazim of defamation following his refusal to support Nazim’s bid to become Speaker of parliament. The scams, first flagged in an audit report in 2009, also involved ruling Progressive Party of the Maldives MP ‘Red Wave’ Ahmed Saleem and President Yameen’s half-brother Abdulla Hameed. Their cases are still pending at the High Court. Saleem was the director of finance at the atolls ministry and Hameed was the minister at the time, while Nazim ran a company called Namira Engineering. Saleem and Hameed are charged with abuse of power and violation of state finance regulations. 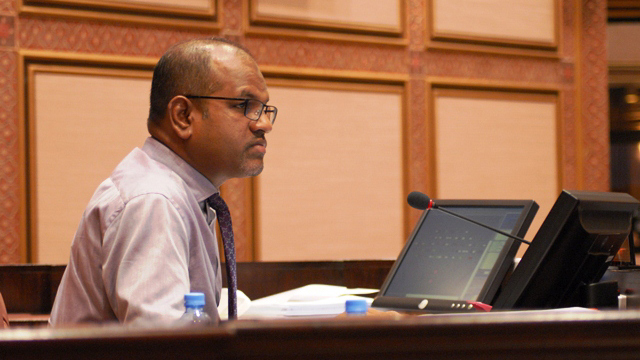 During the original trial held at the Criminal Court, the then-employees of Nazim’s Namira Engineering testified under oath that they were instructed by Nazim to bid for the projects – however, the presiding judge concluded from their testimonies that they were responsible for the procurement fraud and therefore dismissed the testimonies against Nazim on all counts. According to the audit report, documents of the company which won the bid, Malegam Tailors, showed that it shared the same phone number as Namira. Fast Tailors, another company that applied, also shared a different number registered under Namira. Another company, Needlework Tailors, which submitted the bid, had an employee of Namira sign the documents under the title of general manager, while a fourth company named ‘Seaview Maldives Private Maldives’ did not exist. Auditors noted that the Seaview bid documents had an exact date error also found in Fast Tailors documents, and said the error was sufficient to prove the same party had prepared both bids. The prosecution began in late 2009 after police uncovered evidence that implicated Hameed, Saleem and Nazim in a number of fraudulent transactions. At a press conference in August 2009, police exhibited numerous quotations, agreements, tender documents, receipts, bank statements and forged cheques showing that Nazim received over US$400,000 in the scam. Police further alleged that MP Saleem actively assisted from the atoll ministry, while Nazim’s wife Zeenath Abdullah abused her position as a manager of the Bank of Maldives’ Villingili branch to deposit proceeds of the fraudulent conspiracy. Police said Hameed as minister played a key role in the fraud by handing out bids without public announcements, making advance payments using cheques against the state asset and finance regulations, approving bid documents for unregistered companies and carrying out discriminatory treatment of bid applicants. A hard disk seized during a raid of Nazim’s office in May 2009 allegedly contained copies of forged documents and bogus letterheads. Police alleged that money was channelled through the scam to Nazim, who then laundered cash through Namira Engineering and unregistered companies. The opposition Maldivian Democratic Party (MDP) has set eight conditions for supporting a candidate for the Speaker of the 18th People’s Majlis. The main opposition party contested the parliamentary elections in March on a platform of judicial reform and empowerment of local councils. With the next speaker due to be elected through secret ballot at the first sitting of the newly-elected parliament on Wednesday (May 28), the question of which party should control the post of speaker has led to tension within the ruling coalition. While Jumhooree Party (JP) Leader Gasim Ibrahim has announced his bid for the speaker’s post, President Abdulla Yameen has said repeatedly that the speaker should be a member of the ruling Progressive Party of Maldives (PPM). The Progressive Coalition – made up of the Progressive Party of Maldives (PPM), Jumhooree Party (JP) and Maldives Development Alliance (MDA) – secured 53 out of 85 seats in the March 22 parliamentary polls. The MDP won 26 seats while independent candidates won five seats and the religious conservative Adhaalath Party won one seat. Three independent candidates along with MDP MP-elect for the Thimarafushi constituency, Mohamed Musthafa, have since signed for the PPM, bringing the ruling party’s numbers up to 37 and securing a two-thirds majority for the coalition. However, neither party on its own has enough MPs-elect to reach the 43-vote simple majority. While the PPM and MDA is one vote short of the simple majority with 37 seats and five seats respectively, the JP and MDP falls three votes short with 40 seats. Meanwhile, PPM MPs Ahmed Mahloof and Ahmed Nihan revealed in the wake of the parliamentary elections that the pair had pledged their support for Gasim’s bid to become speaker during negotiations for forming the Progressive Coalition ahead of last year’s presidential election runoff. Moreover, former President Mohamed Nasheed – acting president of the MDP – signalled the opposition party’s support for Gasim following a meeting at the business tycoon’s residence last month. The PPM has meanwhile yet to announce the party’s choice for the speaker’s post. However, PPM MPs-elect Ahmed Nazim – deputy speaker of the outgoing parliament – and Abdulla Maseeh Mohamed have expressed interest in becoming the next speaker. The ruling party appears to be divided over which MP to nominate for the post with Tourism Minister Ahmed Adeeb – deputy leader of the PPM – claiming that allegations of corruption that surfaced in the press last week were linked to his refusal to support certain individuals for the speaker’s post. Adeeb later told newspaper Haveeru that PPM MP Nazim was behind the corruption allegations, which are currently under investigation by both the Anti-Corruption Commission and auditor general’s office. Adeeb said he could not back Nazim’s bid to become speaker as he was suspected of “blackmail” and “corruption” and declared his support for Maseeh. “This problem [corruption allegations] has come up because my stand is strong inside the PPM. I am accused of these things because I take the stand that is most beneficial to the country. And because I have influence within PPM,” he alleged. “This is a political ploy to defame myself, PPM and the government. This has been done to blackmail me in order to politically twist the Majlis speaker issue a certain way.